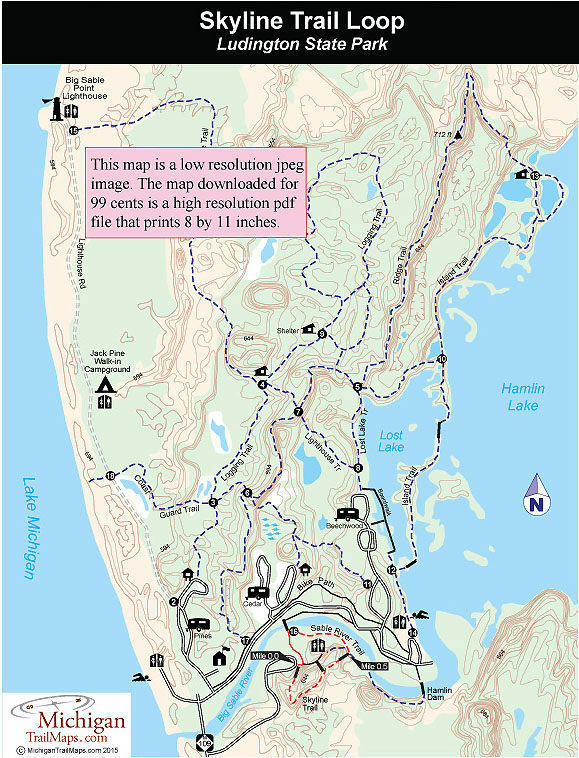 Ludington State Park features more than 20 miles of trails but the most popular path in the park is also the shortest: the Skyline Trail. This half-mile path requires you to climb stairways to the crest of a dune, but once you’re on top the walking is easy and the views are spectacular. Three stairways provide access to the Skyline Trail. They are located in the parking lot on the south side of the Sable River, near the center of the trail and along Sable River Trail. By following a portion of the Sable River Trail and the Skyline Trail in a clockwise direction from the parking lot, you’ll make a 1-mile loop and encounter the interpretive posts in numerical order. There are thirteen numbered posts along the boardwalk that correspond to information in a brochure available from map boxes at the foot of each staircase or can be downloaded from this site. They identify the three common evergreens in Michigan, explain dune country succession, and point out stumps and other remnants of the loggers who arrived in 1851 to cut down the white pine. From the parking lot, follow the paved path to post No. 16 at the bridge across the Big Sable River to pick up the Sable River Trail. Head east on the trail which skirts the south bank and at Mile 0.5 reaches the Skyline Trail stairway closest to the Hamlin Dam. The stairway, especially from a child’s point of view, looks like an endless series of steps to the sky. But the climb is a small price to pay for what awaits at the crest of the dune. Once on top you’ll discover the trail is really one long boardwalk. 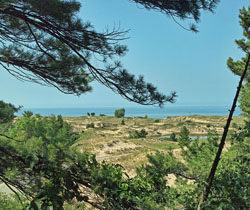 Erosion of the sand dune prompted the park staff to replace the original trail with the wooden path in 1981. It was an immense project that took two years and included the Air National Guard using its helicopters to airlift much of the lumber to the top of the dune. Though the trail on top is less than 0.5 mile long, there are numerous benches where you can sit and admire the stunning scenery. There are also thirteen numbered posts that correspond to an interpretive brochure available throughout the park. The topics range from identifying the three common evergreens in Michigan, to dune-country succession, to the remnants nineteenth-century loggers left behind. At post number 6 there are rows of benches where you can sit and view the Big Sable River emptying into Lake Michigan. An even more impressive panorama awaits you at post No. 11. Here you can gaze south and see miles of open dunes stretched out to the Lake Michigan shoreline, the Ludington Harbor Lighthouse, and on a clear day even the Silver Lake Sand Dunes 25 miles away. After post No. 13, you reach the third stairway that descends to the parking lot and completes the loop.